Maybe I shouldn’t let the cat out of the bag, or Pandora out of her box, but the practice gratitude is subversive. Just as The Cluetrain Manifesto theses #7 asserts – Hyperlinks subvert hierarchy – so does gratitude. Gratitude is subversive because it changes relationships, especially those in organizations where hierarchy rules. In many of the organizational settings in which we work, we are serfs to the the lord of organizational process. Procedures rule, and human initiative, ingenuity and creativity are subverted to the cause of order and standardization. This is order for an earlier time when business and production processes were predictable and regimented. Today’s order is random, chaotic requiring people and organizations to function with a high level of agility and quickness. Instead of the order of parts in their fixed place, today’s order is dynamic, shifting and found not in the parts but in their connections to one another. We see this in particular in those cross-discipline work teams that surmount the traditional boundaries of hierarchy. What we are discovering, and the practice of gratitude is showing, is that truth is not in the discrete, isolated parts, but in their connection to one another. On a human scale, this means that our identity is not our position, title or place in a system, but rather the function that we have in connection. Collaboration and shared responsibility is the ground for understanding who I am within any social and organizational setting. The connection between the parts is where the action is, and the organization lives. A decade ago, I worked on a project with a hosiery mill to revamp how they organized their production process. The process involved seventeen steps in the making of a pair of men’s dress socks. Steps from weaving the thread, to dying, sewing the toes, attaching the adhesive paper tab to hold the socks together, to the packaging for shipping. What we discovered was that each step in the process was isolated from the one before and the one after. Ask the men and women who worked the line about the process, they couldn’t say much beyond a general description what happened at any one place along the line. They had one job, one job only, to do that job every day. As a result, each station was organized to produce eight hours of product each day. It was a system of disconnection that produced more inventory than orders, as the plant’s purpose became the process, not the product. The production chief eventually realized what has happening and initiated the discussion that led to the project that I was on which unified the production system. Before the change, it took six weeks to make a pair of socks. After implementation, only six days. The major difference was connecting the whole system to focus on order fulfillment, instead of maximizing the productivity of each step of the process. By connecting every step to a common purpose, efficiency and capacity grew. Unfortunately, the company was unable to make the same shift to the marketing and sales of their products, and within a couple years of making the change, the plant was closed. Too little change, too late. Here is where the practice of gratitude could have made a difference. Unifying the technical connections of a manufacturing process was relatively simple compared to developing a sales and marketing system based upon connection. If the connection was strong and healthy, the manufacturer could have realized that their business was not making socks, but rather providing a wide-range of services to those retail stores that sell socks. In the end, the weakness of the company’s capacity for engagement with its customers led to their demise. However, with a strong connectional system in place, the company could have done a much better job communicating, collaborating and coordinating the shared responsibility of providing socks customers the best selection and service available. Gratitude is subversive because it affirms and validates the importance of our connections to one another. 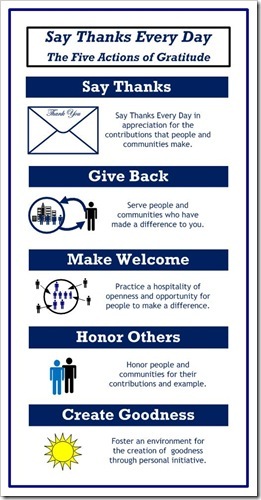 The Five Actions of Gratitude are a practical way to elevate the connectional nature of organizations to a place of impact. The impact of each of these actions strengthens the connectional nature of organizations. The impact of Saying Thanks is the recognition of the giftedness of life that comes through the agency of other people, organizations and communities. The impact of Giving Back is the reinforcement that the true nature of connection is giving. 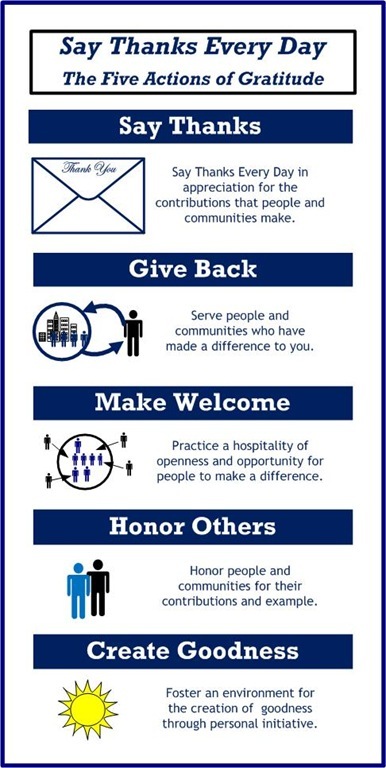 The impact of Making Welcome is the kind of openness that transcends the barriers of organizational hierarchy so that people are free to contribute. The impact of Honoring Others is the recognition and affirmation that giving makes a difference that matters. The impact of Creating Goodness is the strength and satisfaction that comes from making a difference that matters. The connection that people have within an organization is strengthened when these actions are practiced. The practice becomes a feedback loop of giving and response that is transformational because it changes the avenues for communication within the organizational structure. It is important though to see that this is not just about our relationship connection in organization. That is a part of an organizational connection system that involves all aspects of the organization. In a connectional system, each party shares responsibility for the whole system. The Connecting Ideas of the Circle of Impact – Purpose or Mission, Values, Vision and Impact – are the connecting links that not only provide a social basis for shared responsibility, but also an organizational. For the mission of the organization – its purpose or identity – provides the rationale for the kind of structure that is needed. Its values provide the rationale for our human connection to one another. And a vision for impact provides a rationale for the action towards impact that people jointly take through the social and organization settings. In a connectional system, all parties are responsible, and all are accountable to one another as a whole organization. Their individual responsibilities may differ according to position, talent, expertise, and task. 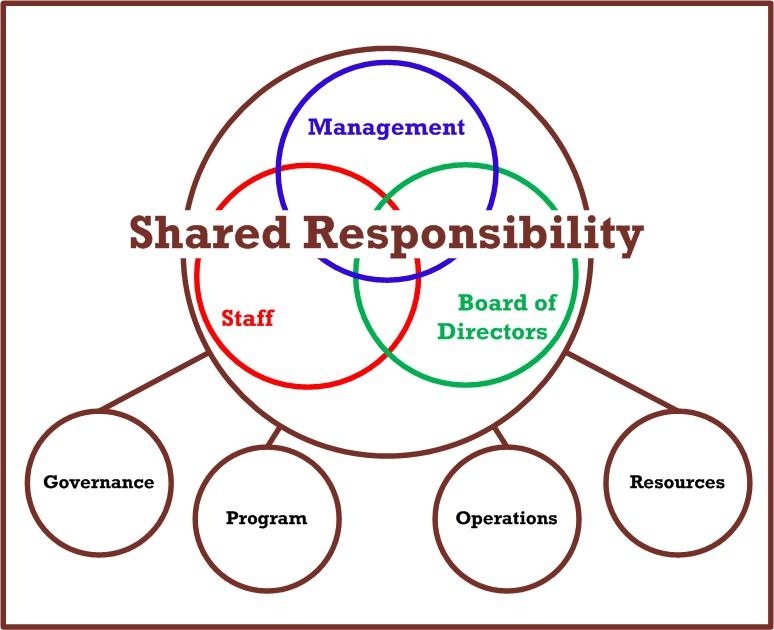 This diagram is of one type of system of shared responsibility where management, board and staff share together the functions of governance, program, operations and resources. This type of system is based on a connection system of relationships where there is a high level of communication, collaboration and coordination practiced. I hope this begins to show how the practice of gratitude is not just a way to create an ethical environment within an organization. My intent is to provide a picture of how a strategy of strengthening the relational connection of people in an organization is a way to develop a more agile, effective organizational structure. For the relational connection to grow, requires that connection to be marked by the recognition and support of a culture of giving and a response in gratitude. 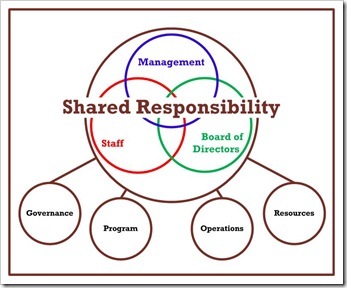 A system of shared responsibility provides a way for organizational leaders to align the parts of their organizations into a connected, collaborative, coordinated whole. I believe this is a beginning picture of the future of organizations at the structural level. Next week: I will begin to look more closely at the individual practice of each of the Five Actions of Gratitude, beginning with Say Thanks Every Day. Tagged with barriers, board of directors, boundaries, Cluetrain, connection, create goodness, Five Actions, give-back, governance, gratitude, hierarchy, honor others, leadership, Make Welcome, management, obstacles, operations, parts, program, resources, Say Thanks, Say Thanks Every Day, shared responsibility, staff, strategic.